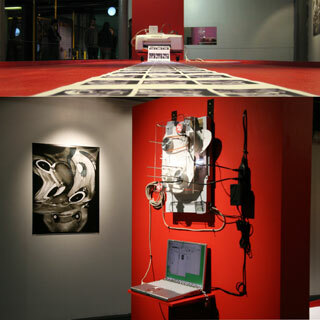 The AV Festival is among the main events in the UK that focuses on image and sound practices in the digital network era. The third edition of this biennial festival took place recently in the North East of England, while the exhibition “sk-interfaces”, at the FACT in Liverpool, brought together the works of artists who are considering skin as an interface. The AV Festival extends over the cities of Newcastle, Middlesbrough and Sunderland where posters and other supports clearly set the tone: “This is the transmission. Are you receiving?” This 2008 edition was in fact conceived around the notion of broadcasting, which is a notion that merits re-examination in the era of the Web 2.0. It was a series of discoveries initiated during the second half of the 19th century that gave rise to the birth of television. So it is naturally at the Discovery Museum in Newcastle where Yuko Mohri evokes one of its principal inventors, John Logie Baird’s, through an installation entitled “Bairdcast Media: A History of Machine Translation”. The young Japanese artist has taken inspiration from the research of the Scottish inventor of the “Televisor” who broadcast the first television image in grey tones as early as 1925. More than 80 years later, Yuko Mohri has replaced the selenium cells with the CCD sensors of a scanner and it is with rotating discs covered in photographic images that she evokes the Nipkow disk used by Baird. An ink-jet printer is placed at the other end of the chain. 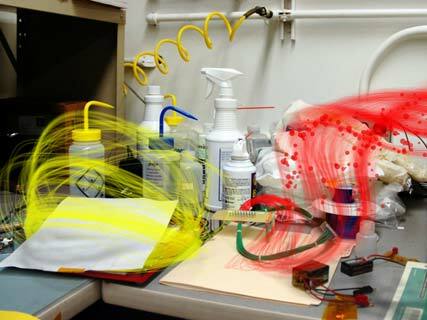 Placed on a board with rollers, it gradually moves closer to the rest of the installation each time it prints “photographs” transmitted by the network. With these images that look like portraits and whose printing streaks evoke the lines that the first photograph of a moving image produced by the “Televisor” had, Yuko Mohri prompts us to observe the journey from Baird’s experiments in 1925, right up to the creation of YouTube, in 2005. 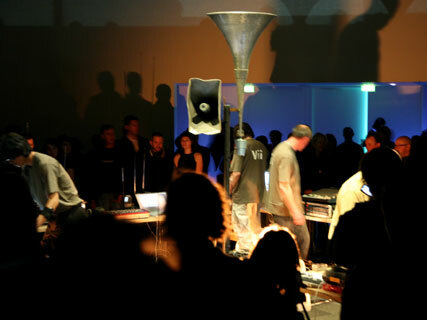 On the other bank of the River Tyne, in Gateshead, another historical outlook is presented at the contemporary art centre, the Baltic, offered by the artists Atau Tanaka and Matt Wand accompanied by members of the Zoviet France Collective, in interpreting a performance of “Variation VII”. 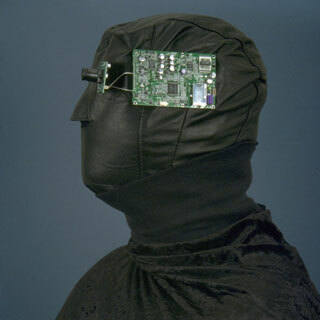 Conceived by John Cage, it was created in New York in 1966 during one of the evenings of the founding events of Experiments in Art and Technology entitled “9 Evenings: Theatre and Engineering”. Its author described it rather simply, though its performance was relatively complex: “It is a piece of music that is indeterminate in its form and its detail”. Cage asked the Bell telephone company to broadcast ambient sounds coming from places like press rooms or electrical stations to which he added radio waves and the “noises” of a large number of electrical appliances during the performance… For Cage this was about “going fishing for sounds”. There were no musical scores, but a detailed plan that the artists of the Baltic interpreted by gathering audio flux coming from television satellites, cell phones and other Internet connections, with, once again, numerous electrical and household appliances. The result was nothing short of a sonic maelstrom without any real breaks, that was perpetually metamorphosing and always in transition. It is an uninterrupted flux from which it is never really possible to disassociate sounds coming from here from sounds coming from elsewhere. The only certitude is the fact that this multiple poaching, these waves, these interferences, noises and other mechanical rhythms are all coming from what can be heard now. “ Broadcast Yourself”, proclaim Sarah Cook and Kathy Rae Huffman through the works they have grouped together at the Hatton Gallery at the University of Newcastle. By borrowing this slogan from YouTube, the two curators are clearly announcing their willingness to explore the work of artists who, during the past thirty years, have adopted the television as a medium. 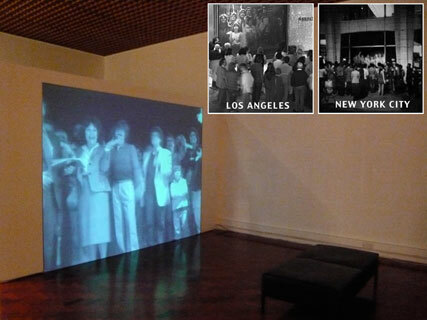 A major work is exposed there in the form of two video projections set up face to face. It is called “Hole in Space” and dates from 1980 when Kit Galloway and Sherrie Rabinowitz hooked up the two coasts of the United States with a video link over three evenings. It was a great surprise for the people in the street in New York as well as in Los Angeles to respectively discover each other through the projected images. No information was given about what was happening, either at the Lincoln Center in New York or at the Broadway Department Store in Los Angeles. So there were questions like: “Who are you? Where are you?” Then a game of passing objects arose and some laughed, others shouted, some couldn’t be bothered, others flirted; in New York a florist sang, in Los Angeles they listened… The public was completely taken with the “communicating sculpture” of the two artists of which Gene Youngblood rightly said, “they create context rather than content”. A piece by Bill Viola that participates in underlining the difference between communication and reception, adjoins “Hole in Space”. It is called “Reverse Television - Portraits of Viewers” and perfectly illustrates our passivity when we watch television. 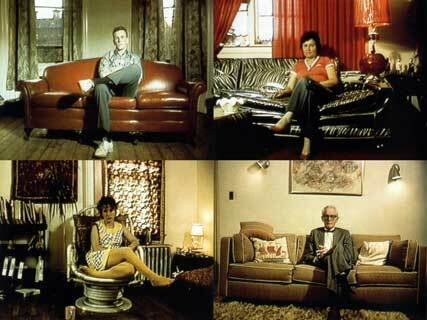 The American artist made forty or so portraits of people living in and around Boston in 1983, at home, in their living rooms, in front of the television. One is smoking, another is drinking, and the décor changes but their positions are similar. These short slices of boredom were then broadcast on WGBH, a local television channel and one can imagine the surprise, the confusion of the television audience in front of their televisions suddenly seeing mirror images of themselves for a brief moment. Let's leave Newcastle now to go to the Design Center of the University of Sunderland where the exhibition “Prepared Radios” is located, regrouping strange radios. 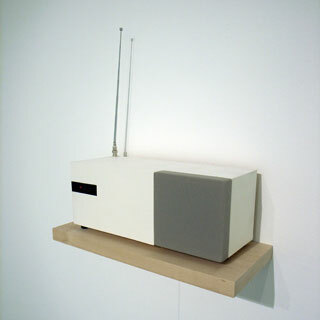 Ryota Kuwakubo has conceived these radios and also “prepared” them, because even though they receive the local radio stations, they only broadcast consonants. The vowels have been filtered out in real time by a device created by the Japanese artist, so all we hear are sounds like SSS, T, P… And though they are far fewer than consonants, we understand by their absence the fundamental “linking” role they have within language. In the gallery space it has therefore become impossible to make any sense whatsoever of any of it, or even distinguish a word. Nevertheless, the musicality that is unique to every language has been somewhat preserved. The music here again is stronger and one inevitably thinks of John Cage in 1935 when he placed a few objects between the chords of a piano that he described as “prepared”. Coming back to Newcastle, not far from what the inhabitants call “The Monument”, we come upon a caravan that has been transformed into a mobile cinema. 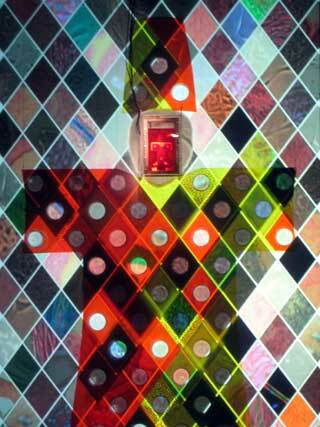 “Magnetic Movie”, made by the English collective Semiconductor, is among the films that are projected in a loop. This short film is entirely representative of the new cinematographic languages that stem from hybridization. Ruth Jarman and Joe Gerhardt spent time in residence at the space sciences laboratory of the University of California from which they brought back several photos accompanied by the testimonies of research scientists specialized in the observation of magnetic fields. Back at their studio, they “augmented” the lab photos with a few points, lines and other animated surfaces with highly saturated colours while also enriching the interviews with the research scientists with a few sonic artefacts. Everything here encourages us to believe what we see and what we hear. The lab interiors look like what we would expect them to look like and the speeches of the scientists are extremely well structured and based, as they ought to be. So the improbable visual representations of hypothetical magnetic fields, although entirely magical, become almost credible. I heard and saw them, scientists talk about them, they exist! 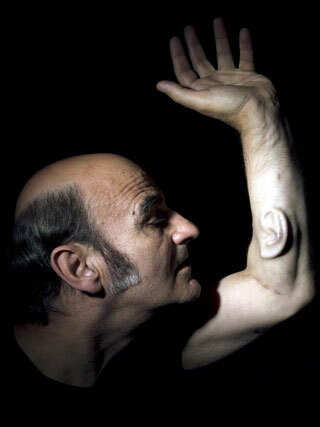 During this time, at the FACT in Liverpool, an exhibition organised by Jens Hauser examines this “membrane demarcating the outside world from the internal spaces of the body” that is the skin. A video by the Belgian artist Wim Delvoye, projected on the façade of the “Foundation for Art and Creative Technology” is among the works of this exhibition entitled “sk-interfaces”. But it takes a few minutes to understand the nature of the landscape that is passing slowly before our eyes in “Sybille II”. What then are these white threads with black heads emerging and twisting about on themselves from a rather uneven skin coloured surface? To the left and to the right, the image is framed by rounded forms that we can identify, after a few moments, as being fingernails. In fact, what we are seeing is a rather insalubrious practice we all know that involves squeezing black heads from skin that we would like to perfect. The discovery of the subject that the extreme “close-up” only slows down invariably modifies our perception, our aesthetic judgement of these “emerging threads”. What then is beauty? Let's now go inside the FACT where there are a few pieces, after the fashion of “World Skin”, that offer an even more metaphoric approach to the notion of skin. This immersive installation already has a history as it was conceived in 1997 by Maurice Benayoun for the CAVE of the Ars Electronica Center, before winning a Golden Nica in Linz the following year so that its code could finally be re-written this year with the support of the Citu research laboratory and the public cultural establishment, Arcadi. We can note in passing that a good number of the “historical” works of the 1990’s were doomed to disappear for lack of being carried over to contemporary supports. The public, when entering into the space of the work, has the choice of observing, exploring or shooting. Passively observing an interactive work can be very frustrating. Exploring means grabbing the joystick to navigate through a war or military landscape of armoured vehicles that seem to be frozen in their actions. 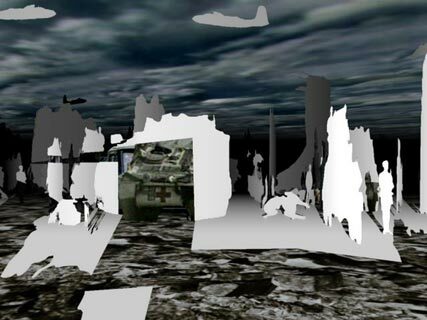 Shooting with a camera that has been “modified” by the artist results in the disappearance of the textures of the zones being shot from the projected landscape. So the spectator, according to the author, “rips off the skin of the world”. The landscape appears to be burned by the flashes of white light of which it keeps the scars while the spectator goes off with the souvenirs of their “Photo Safari in a land of war” by recovering their printed trophies when they leave. There are those who even recall being seized with doubt when the sound of the shutter, shooting in bursts, which participates in the somewhat oppressive sonic ambience composed by Jean-Baptiste Barriere, is transformed into detonations. This gives the word “shoot” an entirely different meaning. Lastly there are a few “artist coats” in this exhibition that illustrate and have crossing the barriers of species in common. 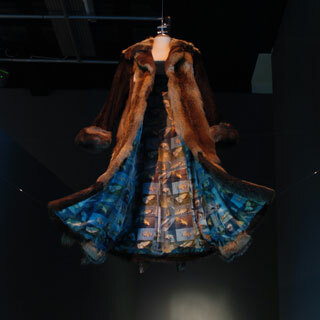 The “Roadkill Coat” is in fact made of animal furs of various species killed by cars that the members of the Art Orienté Objet collective, Marion Laval-Jeantet and Benoit Mangin, have collected from ditches by the side of the road. They have also explored the barrier between the sexes through skin cultures in the laboratory with hybrid fragments of their own skin. They first of all had a few millimetres of skin taken off their backs in order to create, in a sterile milieu, “Artist skin cultures”. The pieces of skin thus obtained were then attached to the epidermis of pigs to then be tattooed with representations of endangered species. No collector having wanted to have them transplanted onto themselves, these precious hybrids are now exhibited in glass jars on shelves, like in a curiosity shop. “Today we are planning a symbolic action” Marion Laval-Jeantet tells us before explaining: “let the horse live in me”. During the performance I will inject myself with the blood of a horse that has been made compatible with mine. This action, which is very difficult to set up given the numerous institutional and legal taboos it gives rise to, reveals again in our eyes, the necessity of enlarging the notion of respect we have for the living and for biodiversity, which are often bulldozed by biotechnology”. 2007 , © Brian Slater. ORLAN meanwhile is dreaming of crossing over an entirely different barrier through a project to cultivate a fragment of skin coming from the hybridization of cells of her own skin with the skin of a black person, at the SymbioticA artistic laboratory, which specializes in research on the sciences of the living. And she too has prepared a coat, a “Harlequin Coat”. The notion of hybridization is an essential component in her work. Her “Harlequin Coat” evokes the preface of a book by Michel Serres, “The Troubadour of Knowledge” in which he sees in the costume of a Harlequin a metaphor for crossbreeding as its cloth is made of fragments whose colours, like its origins, differ. As for ORLAN’s “Harlequin Coat”, it is articulated around a kind of bioreactor containing cells of multiple origins, here again as much from the point of view of species as races. And lastly to conclude, we note that there was also a question of hybridization last May at the Michel Rein Gallery where ORLAN exhibited the last item of her photographic “Self-Hybridizations” series: the “American Indian Self-Hybridizations” where the artist’s photographed face blends with portraits of American Indians painted by Georges Catlin.